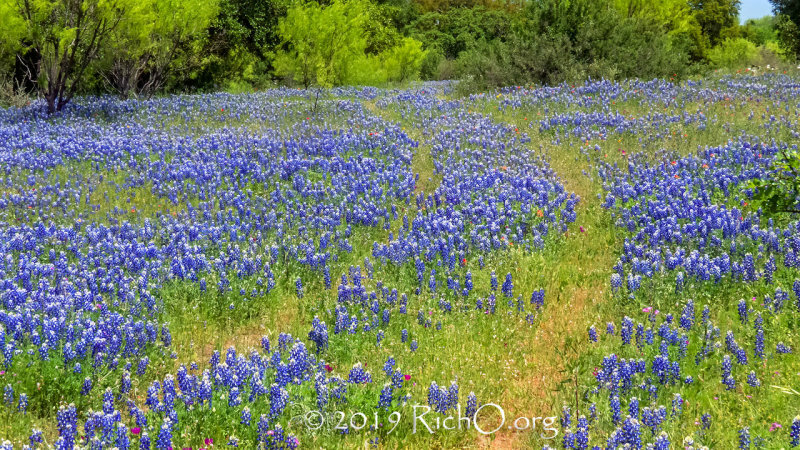 UPDATE: 4/19/2019 Took a short trip out to Mason on 4/19/2019 and the bluebonnets in the locations I checked still looked good. The shocking news is the US 87 from about Loyal Valley to Mason is now multi-colored with a variety of wildflowers. That route even has new spots of bluebonnets, but the real color is from the yellows and reds including Englemann's daisies, prairie paintbrush, firewheel/Indian blanket, mealy blue sage, greentread and bitterweed and others. Summary: There are still some really nice scenes out in parts of the Hill Country. The bluebonnet blooms are faded along some of the roads and on others still looking good. With the rain this weekend and some cooler temperatures in the forecast some of these areas should last into this next week, especially for the larger fields. Often, the large fields actually look a bit better once the white tips of the bluebonnets are mostly gone but still a bit pointy. This seems to be the year of the white prickly poppy. I saw several really large fields of the poppies and a few mixed with bluebonnets. I also lots of Gaillardia sp. – firewheel plants. Parts of the Hill Country could be turning red this May if the rain continues mixed with some sun. Also saw some bitterweed spreading and mixing with bluebonnets at times. More photos later! Details: These are the roads I traveled and does not mean they the only good roads out there right now. Starred routes are best to travel right now. **RR 1320: South from 1323 is doing very well with some nice roadside coverage and a few fields. Still not at the best I have seen this route, but still looking nice enough for a drive. RR 1323: Not as covered as I would hope. If you are traveling from Texas 16 to get to RR 1320 or US 281 then that would be the only reason to travel that road. I did not travel it from Sandy to US 281, so there might be better views along that section. RR 3347: Some nice spots well west of RR 962 towards the end of the payment, but overall not up to the level i would have expected. Still if you want to take the drive you might enjoy the few fields and roadside coverage. RR 962: Should have been better given the fall rainfall. There is one field about 60% on the left going towards Texas 71 north of RR 3347. * Texas 71: The roadside blooms along Texas 71 have faded and not worth the trip for them. However, there are some really nice fields still in play, including one really huge field of white prickly poppy mixed with bluebonnets (photo later). Another nice field on the east side going towards Llano just north of 308. The star for this road is for the fields only. **RR 2323: Very disappointing from Llano to Prairie Mountain School, but from there to close to US 290 there are several really nice views and one huge field with white prickly poppies mixed with bluebonnets. If you are in Fredericksburg then travel RR 2323 north from US 290. US 87: The roadsides along this road from Fredericksburg to Mason have also faded and not many fields developed along this route as in past years. **RR 783: Some nice roadside views and fields still exist along this road going south from US 87. And please find nice safe spot to pull over without damaging the blooms. Sadly, I saw too many already run down by cars. RR 1723: Very disappointing not worth the trip from US 290 to RR 2389. I did not travel down to James River RD, but other reports have been average level to below average. Texas 29: From Mason west to RR 1222 there is some nice roadside coverage still looking good. 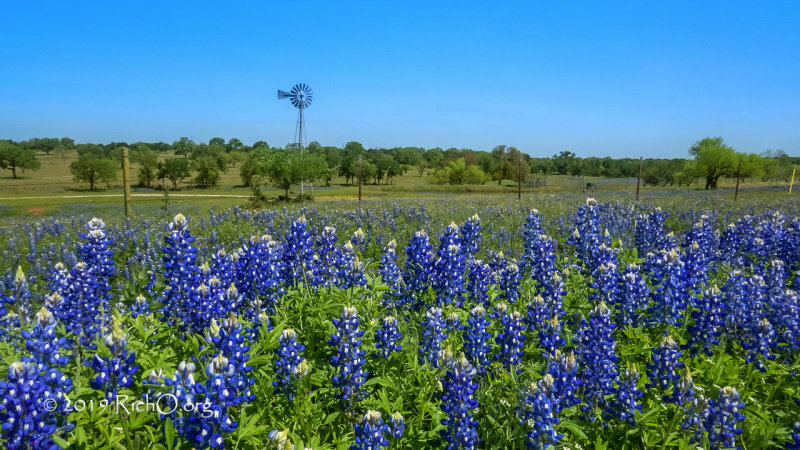 I actually took Texas 29 to Menard and saw one open bluebonnet field along a couple covered with mesquite. Other fields that have been good in the past now have nice green grass and no blooms. I did spot some yellow prairie paintbrush along Texas 29 just east of Hext. RR 1222: Good solid but not very wide coverage of bluebonnets from Texas 29 to US 87. Some small bluebonnet scenes along the way but no large fields spotted. RR 386: Some sporadic roadside bluebonnet coverage and small areas out into fields.